Buy the best portable laptop charger and external rechargable battery for laptop with our reviews and guide of 2018 for you. Hello everyone and welcome again on “PowerBankTalk” the world’s #1 website for The laptop portable charger’s discussion, reviews, and discounts. 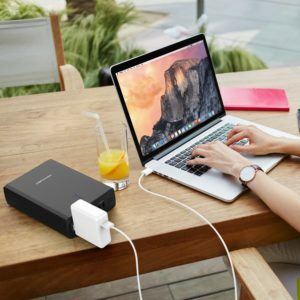 We have brought the most awaited and most requested reviews of Best portable AC power supply or external battery supply for Laptops and MacBook. Almost everyone has asked for this reviews and here it is. 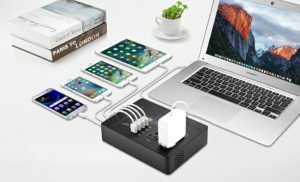 If you are a blogger, student, traveler, wanderer and anyone who needs power supply while you are outdoor here is All in One supply tool for you. Batteries: 8 Lithium ion batteries required. MAXOAK is the huge power source you can ever see in laptop external chargers segment with the highest capacity of 50,000 mAh. Thus this huge power supply comes with the bit of weight but it compensates with long duration of juice for your gadgets. 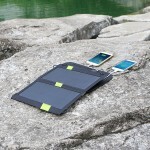 You will be really happy to carry this weight as this battery can charge your laptop and mobiles for multiple days ! yes you heard it right days! Though this is the great power source for all gadgets the company does not allows users to charge MacBooks with this charger. so basically if you have a MacBook this is not for you. It has 6 output ports to charge multiple devices at a time. The main limit is this battery can not Charge Laptop with DC Current Over 4.5A/90W. So you will need to check out your laptop input specifications before buying this. 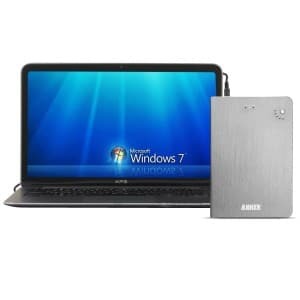 This portable battery has new technology which enables the full speed laptop DC port to charge with up to 2.1 A current and provides universal compatibility. 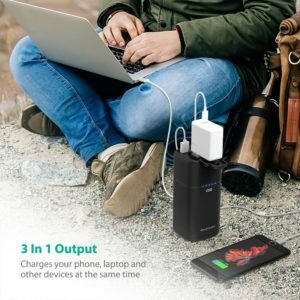 This portable charger has total 6.6 A current output which can charge many devices at the same time through its all ports. The portable charger has premium quality Panasonic cells which provide up to 600 recharge cycles life time and has a unique aluminum Body. Lizone Provides 18 months warranty for this battery pack. And this universal external battery is also compatible with HP Compaq, IBM Lenovo, and all smart phones. 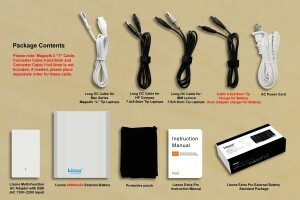 This Laptop external charger is better than previous version mentioned below in Capacity and price comparison. 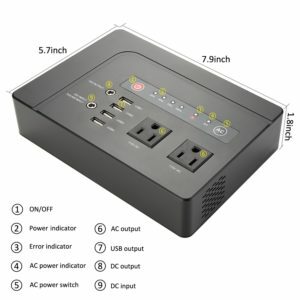 The portable ac power supply comes with 2 AC plug in outputs. yess, You read it right! This is a new brand in the market but looks promising. You can charge two devices with wall plug directly with this power charger. The 42000 mAh capcity is really good to go for few days without electricity. We were amazed to see the 3 output modes of this charger which are 12V DC, and two AC outlet which can support 200W upto and 4 USB ports with fast charge support. 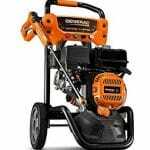 Overall 7 devices can be attached to this beast at a time and you call use 2 AC wall plug which is a huge deal. The battery also has high ratio of dimension vs capacity. The charger can be full charged in 7 hours only. Also the battery is provided with BMS (Battery Management System). The power charger is considerable in size and you will feel uncomfartable carrying it but having AC currents on your demand is amazing. 4 devices can be charged with this charger at a time and 3 of them are USB and 1 AC (3 prong ) outputs. 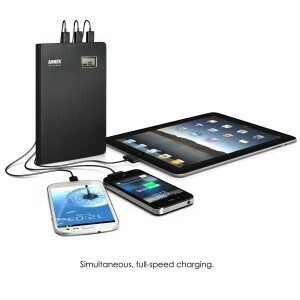 Ravpower has used Fast charge technology thus, it can be charged fully in 6 hours only. Ravpower also has 20100 mAh variant which is very portable. This is perfect charger for trvelers and freelancers. You can use a wall plug and usb ports a time to charge at most 3 devices. The AC output can yeild upto 50W currents and can be used to charge most of the laptops and 12″ MacBook. The most powefull configuration of 80W AC output and higher capcity of 26,400 mAh makes this laptop charger the beast in this segment of external laptop battery chargers. You can almost charge all electronics in your house with this charger. 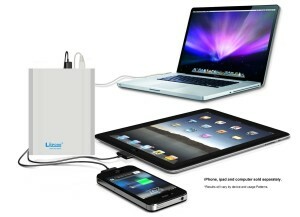 The portable charger has AC output plug so you can plug in your latop or MacBook wall charger and relax. Even the manufacturer claims charger can be used to charge or power the Hair dryer, Projector and drone too. 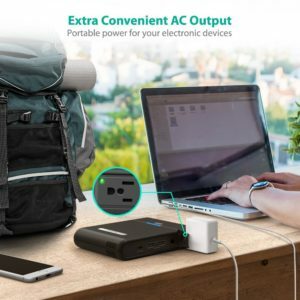 The portable AC power supply has built-in intelligent Fast-Charging technology and also is equipped with a 16.8V/2.2A DC input that provides the ability to charge itself fully in just about 4 hours which is considerably low time. Also, the charger is compatible with all Laptop and MacBook models. The portable battery supply also charges the mobile phoes and iphones but if you want a dedicated small size best iphone power banks here is a list. You can charge your devices number of times with this chager. Amazon bestseller brand in External Portable power supply brings this charger built using PowerIQ technology and also has capacity of 20,000 mAh. This is another version of Anker Astro Pro2 which has the latest powerIQ technology for bringing the best out of external laptop charger. The powerIQ tech detects the device and provides the best possible output for the devices accordingly. Also, it assures the short-circuit proof and long life property of the bank. Any Laptop for 1 to 1.5 times only. This laptop charger has 3 USB output Ports and one DC output port for laptop charging. It can operate on 9/12V for laptops. So it is only compatible with 9/12V laptops. 8-month warranty and friendly customer service. 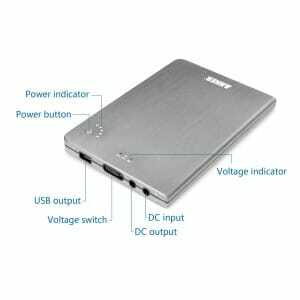 World’s well known and very famous brand Anker brings this amazing universal external power supply pack with a great capacity of 20,000 mAh. This laptop charger has a huge capacity to charge many devices and also a quality assurance with the brand name of Anker. This power supply can charge all laptops for one full cycle i.e. 0% – 100% for one time. The power pack has premium quality Lithium Ion polymer battery cells which assure the quality and more than 500 recharging cycles over the life time of the battery. 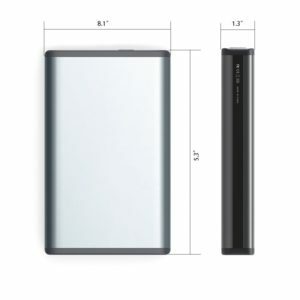 The portable charger has stylish and slim aluminum body with enhanced look and durability. 4 LEDs are provided for indicating remaining juice in portable power charger. And also 1 USB port with 5V/2.1A output for charging all kind of smart phones and tablets. 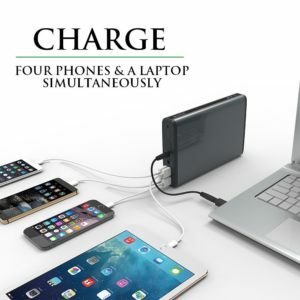 ChargeTech has managed to provide FastCharge technology which delivers 2.4A of current to devices. Also, it has high-speed cable for charging itself within 2 hours. The universal portable power supply is really amazing as it also has a special output of AC which is similar to the wall plug and has the capacity to power up any standard devices which require voltage up to 65W. Which means you can charge any electronic device with this real external power supply unit. Also, it is compatible with all international standards i.e. 110V/120V. This is Airline and TSA approved Power Supply and has the premium quality Panasonic and Sanyo Li-ion battery cells. It has 4 LED indicators for checking remaining juice level. 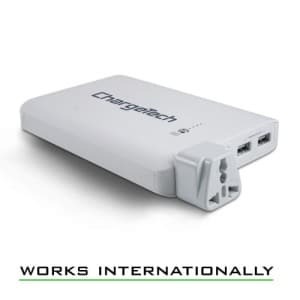 ChargeTech offers the 12-month warranty which we think little less as compared to other brands 18 months warranty.